The highly regarded Orient M-force presents yet another stunning field tool ! The Orient M-Force Air Diver is all about an essential, rugged design matched with substantial functions, just bit more than others in the M-Force family. The only quirk you might have about it is its big, beefy size but that’s what makes it look great! 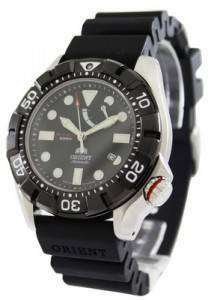 One of the expensive watches from Orient, it is one of the top diver watches in the world. Compared to other M-Force Diver models, this one is bit more modern.The dials are very easy to read. Its offset (or just call that uniquely placed) power reserve indicator hand has lume applied on it and the precision steel bezel with 120 clicks has a stark, black and white contrast. Together, they make things very legible and therefore, appropriate for places where visibility is a factor. Orient implemented its own special structure that complies with several ISO standards – for water resistance, shock resistance and for its ability to withstand magnetic fields. The case and its urethane strap offer maximum flexibility and comfort while the Orient 40N5A in-house, automatic (self/manual-winding) movement keep track of time without missing a beat. This extremely masculine and handsome watch happened to be one of the hottest releases of 2013. It’s about sheer ruggedness without the bells and whistles giving you fantastic additions and not unnecessary technicalities. The previous M-Force features are all present in the Air Diver and lumed markers that seems to glow till the end of time. At 46mm (wide) and 13.3mm (thick), it is Orient’s home-grown design implementation that creates the special structure we spoke about earlier. It has been designed to absorb shocks and impacts from all angles and directions and stop them from being transferred to the movement. This aids in keeping the great accuracy the Air Diver is known for. The Orient designed and manufactured movement that runs inside the Air Diver is a caliber 40N5A automatic. This is made in Japan and also powers other higher end Orient Automatic Divers Men’s Watch; for example, those meant for saturation diving. There’s the time, date and power reserve indicator and its upgrade comes in the form of manual winding capability. Previous generation Orient automatic movements only had automatic winding and no hack feature that’s present in this one. To end, let’s just say the Air Diver is a lot of watch for the money. They are fun, sporty and has an awesome functional edge to it. They wear comfortably and feel tough when worn; that helps you not to bother and beat it around. The Orient Automatic Multi Year Calendar has the best points from every great diver watch, which is a leap into futuristic concepts and embracing new age Diver-s.